The Cairngorms National Park is an excellent outdoor classroom and can be studied across the curriculum from biology and geography to art, history and even music. 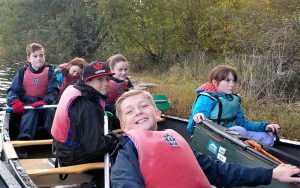 A variety of educational resources have already been produced to support outdoor learning in the Cairngorms National Park with outdoor learning seen as a key approach to delivering the Curriculum for Excellence. However, one of the key barriers that teachers and groups face is the high cost of travel to or around the National Park. The Outdoor Learning travel grant helps to overcome this barrier, offering schools and community groups from across Scotland up to 75% transport costs, up to £200. Applications are scored against the following criteria around priority and activity. Funding is available for one trip per school or community group. Travel Grant Application Form (PDF) (Print version) Click here for a Word version (to fill in on-line). Travel grant evaluation form (PDF) (Print version) Click here for a Word version (to fill in on-line). The travel grant scheme is supported by Cairngorms National Park Authority. or phone Alan Smith, Outdoor Education Officer, on 01479 870518.